Large or small, for a reception, meeting, or for a workshop? Consider the Nanaimo Museum for a unique experience. The museum is the perfect venue for many different types of events, is centrally located with plenty of parking, and is wheelchair accessible. As a non-profit, proceeds from venue rentals go towards our exhibit and educational programming. The Museum has a selection of audio/visual equipment available for pre-arranged use such as a laptop, LCD projector and podium with built in speaker. The gallery also features surround sound speakers with wireless microphone, and a large built-in flat screen TV for presentations & slideshows. We also have a limited selection of catering supplies such as glasses and cocktail plates. Please phone (250-753-1821) or e-mail Chelsea Forseth for more information. You can also contact us through the booking inquiry form below. The gallery provides space for 25-275 people. 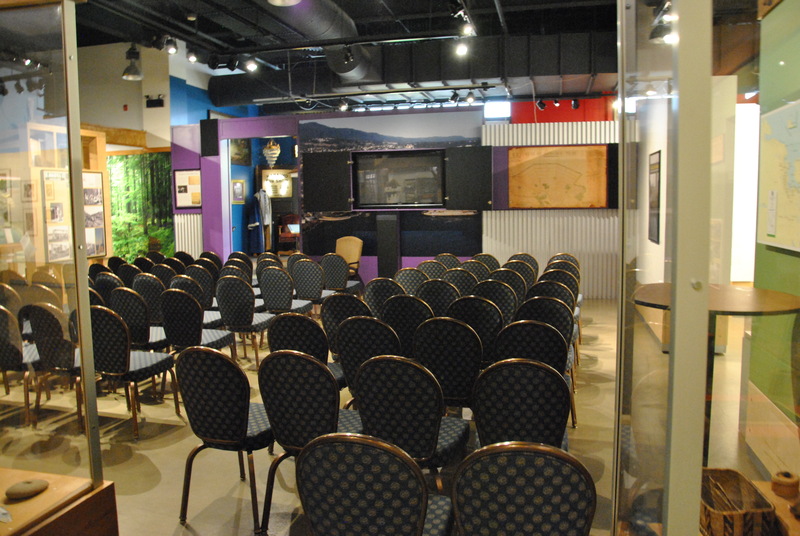 We have held video presentations, birthday celebrations, receptions, wedding ceremonies, concerts, Christmas parties, dinners, book readings and lectures amongst the museum's permanent and feature exhibits. The program room is an excellent space for a board meetings, small lectures, workshops and intimate social gatherings. The room is self-contained and has a fridge, microwave and counter space. This space is available during business hours or after-hours, and holds approximately 50 people theatre-style, 16-20 classroom style, or 18-24 board room style. Over the years we've seen plenty of events. We've compiled a list of frequently asked questions and tips to help your event be a success! Questions about rentals? Fill out the form below and one of our staff will get back to you within 2 business days.